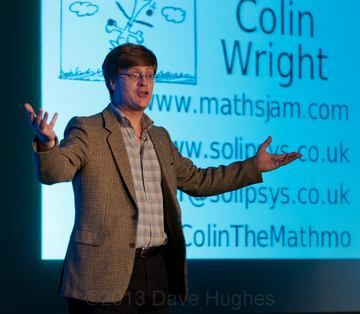 In addition to the Juggling Talk, Colin also gives various talks on mathematics, covering topics such as geometry, Graph Theory, Infinity, Optimisation, puzzles, codes and ciphers, and others. On this page you can find information about each talk - title and abstract. If you would be interested in such a talk then please fill in the Talk Request Form and put a message saying what interests you, or simply send us email. Juggling has fascinated people for centuries. Seemingly oblivious to gravity, the skilled practitioner will keep several objects in the air at one time, and weave complex patterns that seem to defy analysis. In this talk we'll see a selection of the patterns and skills of juggling while at the same time developing a simple method of describing and annotating a class of juggling patterns. By using elementary mathematics these patterns can be classified, leading to a simple way to describe those patterns that are known already, and a technique for discovering new ones. We're used to thinking of "Infinity" as meaning "As big as you can get". In this talk we find that when we think carefully about "going on forever" we discover that there are different types of infinity, and, even more puzzling, and defying all expectation, different sizes of infinity. Prepare to have your mind blown. No knowledge is assumed, but generally given for 15+ as the ideas are deep, and so ages 13-14 might struggle. Starting with a simple doodle, this talk goes via a classical problem from the 18th Century, touches on unexpected connections with modern social networks, and finishes with an unsolved problem with a million dollar bounty. This is a board talk, and it's best if the students have pen/pencil and paper to doodle on. Talks about puzzles, patterns, and then finishes with finding unexpected patterns in juggling. This overlaps with the juggling talk, so best for any audience not to see both this and that. The one thing that distinguishes mathematics from all of science, art, and the humanities, is the question of "Proof". In this talk we examine what proof is, why it's important, and how we can know something is true for ever, even when we can't check every example for ourselves. Timing: 40 mins to 55 mins. Many students are introduced at some point to the Moebius Strip, that wonderfully perplexing strip with a half twist that has only one side and one edge, and which when cut in half doesn't do what you might expect. In this workshop we don't just stop there, but explore what happens with other possible twists and turns, and try to find some way of understanding how this works, what else is possible, and whether we can make sense of it all. Best with one teacher/helper per 8 students. When the astronauts went to the Moon they left behind a reflector so we can measure the distance with incredible accuracy. In this talk we use simple ideas, simple maths, and a whole lot of clever thinking to measure how far away the Moon is from a closed room, using nothing but a stopwatch, a pendulum, and a lot of clever thinking. This is a "lecture" - although it's entertaining. I use a lot of algebra, so the talk best suited to ages 16+, or gifted students who are willing to follow along. With enough warning this could be made into a computer based talk. In the 18th Century the race was on to find a way of knowing for sure exactly where you were at sea. The winner would gain control of the oceans, and save countless thousands of lives. In this talk we see how simple maths, elegantly applied worked to solve the greatest puzzle of the time, and how the same techniques are still used today. This talk starts with some seductively obvious patterns that seem successfully to predict the future, but then goes on to show that not all patterns are trustworthy. It's all too common to try a few examples, find a pattern, try a few more examples, see that the pattern continues, and then leap to the conclusion that the pattern continues forever. This talk gives some examples of patterns that look solid, but which fail, often spectacularly. It goes on to explore the notion of proof in mathematics, and why there are times when we need to be certain. People are familiar with all sorts of games, but as we start to look at them with an analytical eye we sometimes find connections and similarities. In this talk/workshop we play a few games, look for connections, and finish with a result that's genuinely almost too good to be true.